All it takes is a few minutes reading or watching the news, and one thing becomes clear: the world can be a scary place sometimes. As an international student, it’s understandable if you and your family are worried about your safety as you consider universities far from home. Fortunately, in the United States, colleges and universities dedicate ample resources to keeping their students safe. Here you’ll find just one example of an American school and the measures they take to protect their students and campus. There has been legislative action that aims to have a uniform approach as it relates to campus safety, primarily through the Jeanne Clery Disclosure of Campus Security Policy and Campus Crime Statistics Act, enforced by the U.S. Department of Education. This landmark federal law applies to most colleges and universities, public and private, across the country, requiring those institutions that participate in federal aid programs to disclose information about crime on campus and in the immediate vicinity. And while that data can be helpful in keeping students and their families abreast of public safety threats on and around campus, most schools take additional steps to ensure students and faculty are learning and working in the safest possible environment. When it comes to campus security here at Dean College, just like at so many other U.S. institutions, we believe in being proactive. More specifically, being proactive not only means facilitating training for first responders, administrators, and faculty in the most effective ways to respond in the face of a serious event but also in knowing how to spot warning signs, as well as the fundamental importance of clear communication. 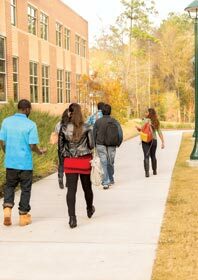 There are three primary ways we have sought to be proactive in confronting the challenges of campus security in this day and age where colleges, universities, and schools are seen as “soft targets.” First and foremost, we have a detailed crisis response plan that covers a range of contingencies both small and large. Undoubtedly, it is a priority that campus security and local law enforcement have a solid working relationship so that there is not only familiarity with the campus and those who live and work on it but also clear and consistent communication between first responders, should an emergency arise. Dean’s crisis response plan covers a number of areas easily overlooked in assessing and assigning clearly defined roles and responsibilities of key stakeholders during and after a campus emergency. Aside from helping first responders do their jobs as quickly and efficiently as possible, the crisis response plan details a clear chain of command in relaying timely information to both those on and off campus, including the news media. While a single spokesperson should handle all media inquiries, Dean College also has in place a Crisis Response Team that includes the College President, Dean of Students, Director of Public Safety and Risk Management, Director of Marketing and Communications, Assistant Vice President for Capital Planning and Facilities, the Director of Resident Life, legal counsel, IT management, and PR support. Dean maintains an up-to-date centralized information tree that includes the contact information for each member of the Crisis Response Team, which also includes an emergency alert text and related protocol that can be sent to each team member immediately. During a crisis, the team coordinates with law enforcement and ensures that any and every logistical question they may have is answered quickly. The crisis response team is then instructed to assess the situation and begin assigning various members specific tasks that run the gamut from dispatching need-to-know information to students and faculty on campus, as well as to those indirectly affected off campus. Another aspect of the College’s crisis management plan is monitoring subcontractors who have access to the campus as maintenance or construction workers. Proactive oversight requires an established protocol to manage subcontractor relationships on campus. Currently the Vice President of College Operations and Human Resources works with vendors to screen subcontract employees before they are granted access to the campus community. Also, a Dean College Operations employee, campus safety officer, or staff member is assigned to supervise subcontract work being done in any of the residence halls. No crisis plan can anticipate every situation that may arise in uncertain circumstances, but the benefit of having a comprehensive, proactive plan is that it can be used as a template in response to not just campus attacks but also for fire, utility interruption and mechanical system failure, severe weather, health-related emergencies, or data breaches. None of this would amount to much without simulated drills and exercises, which Dean College conducts regularly. Each faculty member is required to complete training in campus safety that includes best practices in terms of lockdowns and communication. Dean College has also entered into a partnership with the local Special Weapons and Tactics (SWAT) unit in the conduct of training exercises on campus to test and improve emergency response and safety efforts. And in addition to working closely with local law enforcement and having a detailed crisis response plan and team in place, Dean College is working toward entering a partnership with Life Button 24, a company with a smartphone app of the same name that instantly connects students with safety personnel in an emergency situation. Life Button 24 can assist students who may feel they are in a potentially dangerous situation not just on or around campus, but anywhere in the continental United States. Also, because the app is equipped with GPS sensors, it can provide law enforcement with the exact location of the student. While no plan can ever guarantee there will never be an incident on campus, even in one of the safest cities in America, the fact remains: luck favors the prepared.